Should I lower my prices as a response to shrinking demand? But I want to challenge you to think this through carefully before indiscriminately squeezing what may be left of your profit margins.Â Naturally, this question is quite involved and far too complex to address comprehensively in a single article. But there are some important considerations that we can highlight here to help you start to create a framework for your decision-making process. Let’s be clear. In this rapidly-changing economic environment, price is not the issue. Oh I know it seems like it. 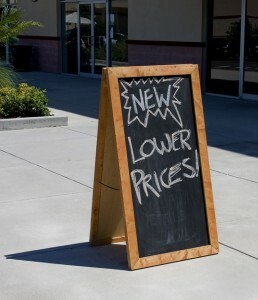 Your salespeople and front-line staff may even be telling you that your prices are high. Your customers and clients may even be telling you that price is a big factor in their decision-making. But this is almost always less than the truth. The real issue is value. So… to begin with, you must get to the bottom of what your customers’ needs really are. And if you’re working from data that are more than a few weeks or a few months old, you’re already out of touch. Sadly, most businesses aren’t working from any real data at all. “Gut hunches,” sticking your finger in the wind to see which direction it appears to be blowing, and looking at your own sales numbers don’t count. For this answer, you’ll have to get your hands dirty. You’ll have to make some potentially uncomfortable phone calls — perhaps even personal visits — and initiate the dialogue with your customers like this business owner did. Your customers are likely not making decisions purely on price. Granted, there are always exceptions, but our tendency is to assume that our own businesses are automatically in that category when a remarkably few actually are. The fact is that your customers’ needs and wants are changing faster than ever. And while you can’t afford to repackage products and services every single day, this is quite possibly where you need to start once you have a legitimate idea of what your customers really need and want. Perhaps they need more confidence that their investment in your products and services will have a larger (or longer) payoff. In that case, extended warranties or different complementary products and services should be offered. In some cases, your customers simply need more of a personal touch. Some buying decisions are being prolonged — not because resources aren’t available, but because confidence has been shaken. Don’t mistake hesitance for inability. But also don’t make the mistake of assuming that the drivers and motivations of your customers are what they were last year. Priority 1 for us when working with our clients and coaching group members is to put in place systems to measure what’s actually happening in their businesses. From a marketing standpoint, this means that your message — that thing that actually connects you with your target market — must be tested. I’d say that it needs to be tested more than ever before, but the fact of the matter is that it always needs to be tested. The money that you were leaving on the table a few years ago because your message wasn’t “spot on” was something you may not have noticed. Today it could be the difference between survival and failure. The time is now to turn your entire organization into an aggressive listening machine.